So I got the happy news that Cherryroms is back up again. Once upon a time, it was known as one of the best ROM sites around. Then their ROM server crashed, but the forums remained. Then in 2006, the site died. And now apparently, it’s back again. I’m not writing this post just out of personal nostalgia though. 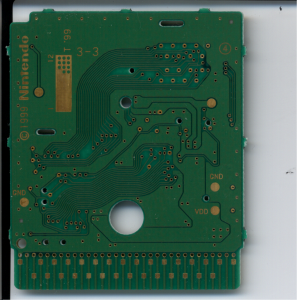 It was also on Cherryroms that neviksti first posted about his efforts to decapsulate a Game Boy CPU an extract the DMG-01 256 byte internal bootstrap which is used to check the Nintendo logo and checksum on a cartridge before deciding to allow booting the cartridge. The function of the bootstrap was known and even documented in a patent however the actual memory content had never been dumped up to that point, so neviksti’s effort brought something new to the table. The original thread can now be read in its entity again on Cherryroms here. 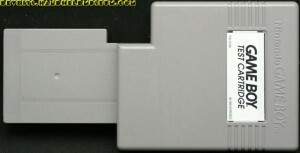 These are official Game Boy flash cartridge sold in Japan. You would go to a designated flashing station and have your cartridge flashed for a cheap price. 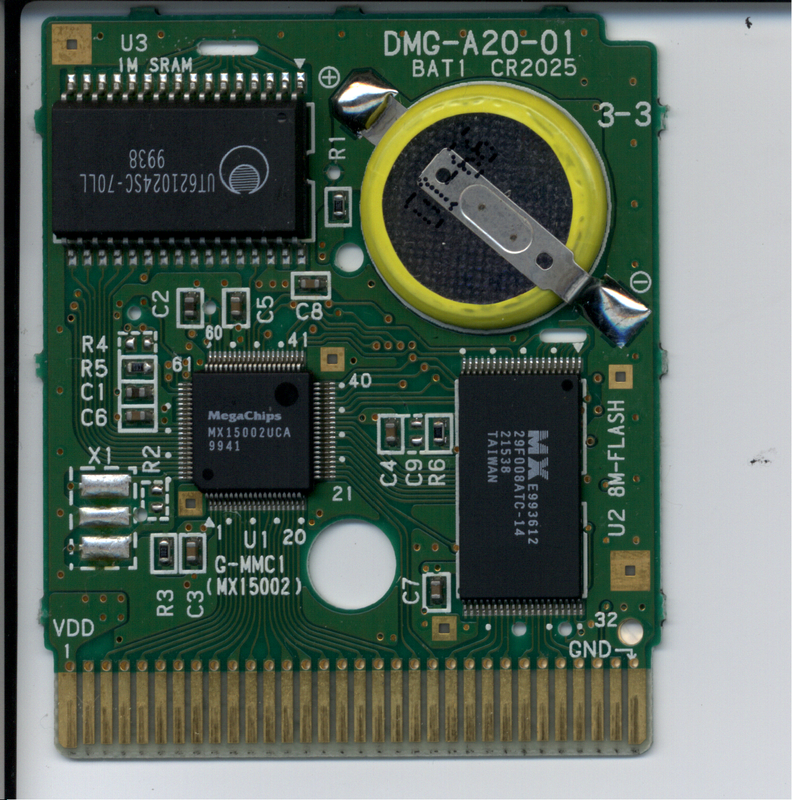 The board contains three intergrated circuits. 29F008ATC-14 – 8 Mbits (1 Mbyte) flash ROM. I can’t find a datasheet for it, so I’m guessing it’s a custom or OEM chip. 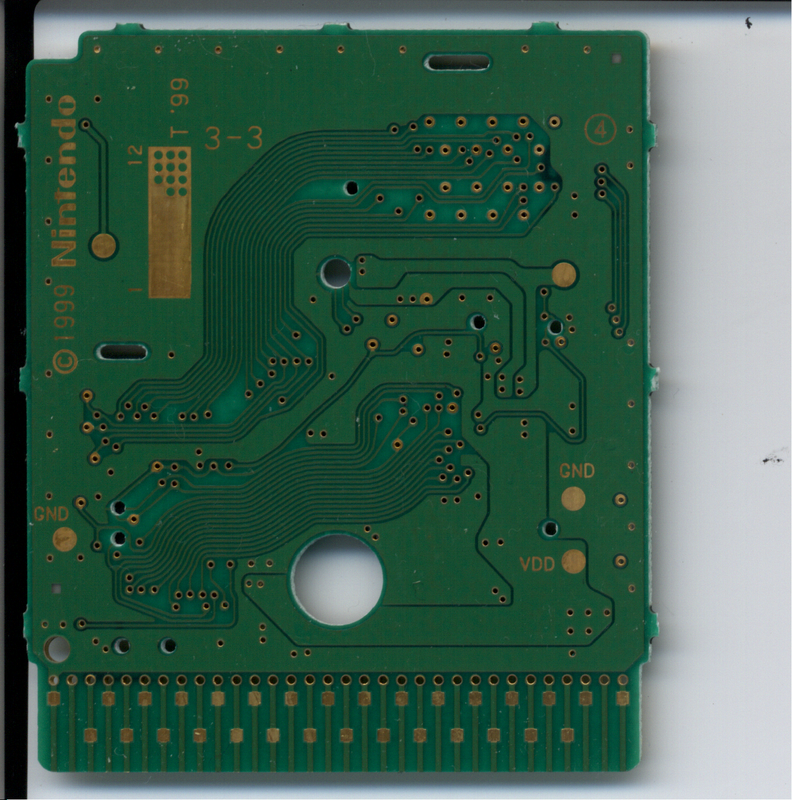 I’ve seen Mask ROMs/OTPROMs in game cartridges also marked MX, so Nintendo probably had a contract with them. UT621024SC-70LL – 1Mbit (128 kBytes) of battery packed save RAM. MX15002UCA – Custom logic chip marked G-MMC1. The apparent function of this chip is MBC like functionality. 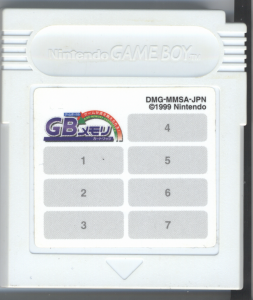 Maybe there’s more to it too, like the ablity to offset the ROM and RAM addresses for multigames or flash memory protection? Details unknown. There’s an unused place for a crystal. 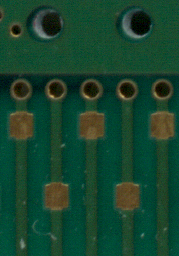 Note the square boxes on the back side, of the PCB, on the opposite side of the connector that goes into the cartridge header. These were most likely used in the factory to program the cartridge initially. Notice how the “unimportant” system clock and external audio inputs are missing this box. Also note the nice rounded PCB traces. Not often you see these. Visually appealing, indeed. And maybe it’s a sign I’m getting too little sleep that I’m seeing a “face” in the image. The scans are provided by Duo. 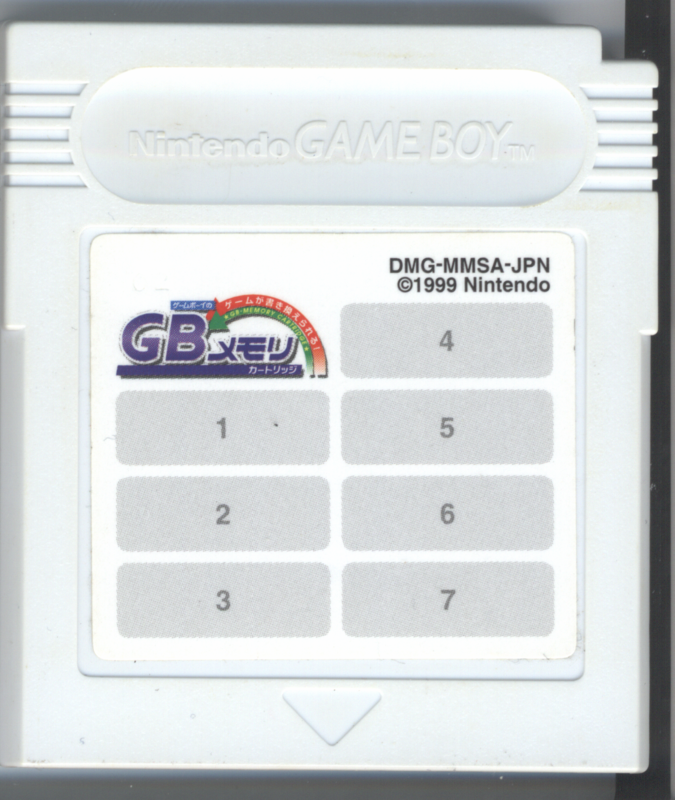 This page has a list of development kits and test cartridges for various 8-bit era consoles and handhelds, including Gameboy and Gameboy Color. The top picture is the so called WideBoy which is a device that you plug on top of a FamiCom. 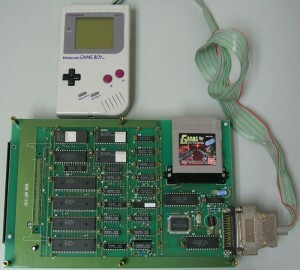 It duplicates the image to the TV attached to the FamiCom to relieve the eyes of the poor developers. 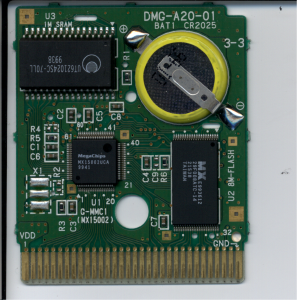 The bottom picture is a funny looking cartridge which is in fact just a simple EPROM cartridge. Thanks nordloef for the tip. AntonioND (programmer), V-Bop (me, art designer and director) and and a few more people are working on a Game Boy (classic, non color) game. We need a musician with experience in Tracker (like LSDJ). This is a serious project, AntonioND just finished engine for the game and I’m working in the story and graphics. The game will be a mix of graphic adventure and top-down perspective. The software to make the music will be OpenMPT, with special (and limited) *.mod file.